This Case Study is a guest post written by Titouan Galopin, lead engineer and product lead at EnMarche project. Please note that this is a strictly technical article; any political comment will be automatically deleted. In April 2016, Emmanuel Macron, now President of France, created a political movement called "En Marche!" ("On the Move" in English), initially as a door-to-door operation to ask the public what was wrong with France. Unlike established political parties, En Marche! didn't have any infrastructure, budget or members to support its cause. That's why En Marche! relied on the power of Internet since its very beginning to find supporters, promote events and collect donations. I started to work for En Marche! as a volunteer in October 2016. The team was small and all of the IT operations were maintained by just one person. So they gladly accepted my proposal to help them. At that time, the platform was created with WordPress, but we needed to replace it with something that allowed faster and more customized development. The choice of Symfony was natural: it fits the project size well, I have experience with it and it scales easily to handle the large number of users we have. We use Google Container Engine and Kubernetes to provide scalability, rolling updates and load balancing. The Symfony app is built from the ground as a Dockerized application. The configuration uses environment variables and the application is read-only to keep it scalable: we don't generate any files at run-time in the container. The application cache is generated when building the Docker image and then is synchronized amongst the servers using the Symfony Cache component combined with a Redis instance. 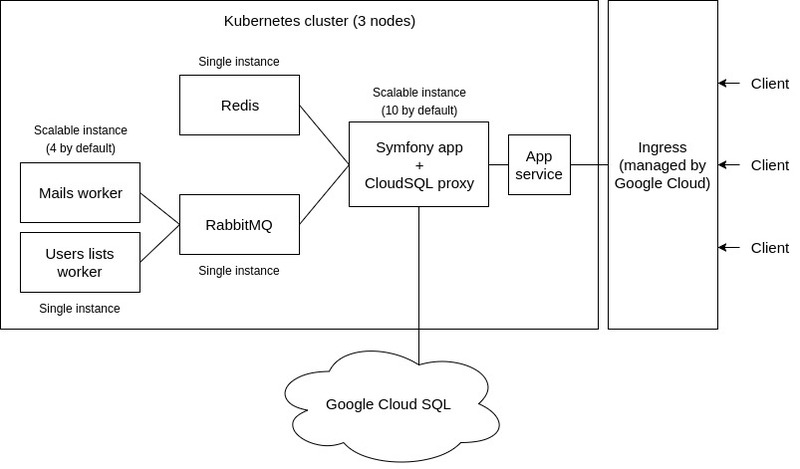 There are two workers, managed by RabbitMQ, to process some heavy operations in the background: sending emails (sometimes we have to send 45k emails in a single request) and building the serialized JSON users lists that are used by several parts of the application to avoid dealing with slow and complex SQL queries. The database uses Google Cloud SQL, a centralized MySQL database we don’t have to manage. To connect to it, we use the Cloud SQL proxy Docker image. The project uses a Continuous Delivery strategy, which is different from the Continuous Deployment approach: each commit is automatically deployed on a staging server but the production deployment is manual. Google Container Engine and Kubernetes are the key components to our deployment flow. The Continuous Delivery process, as well as the unit and functional tests, is handled by CircleCI. We also use StyleCI (to ensure that new code matches the coding style of the rest of the project) and SensioLabsInsight (to perform automatic code quality analyses). These three services are configured as checks that each Pull Request must pass before merging it. Authenticate on Google Cloud using a Circle CI environment variable. Build the three Docker images of the project (app, mails worker, users lists worker). Push the built images to Google Container Registry. Use the kubectl command line tool to update the staging server (a rolling update). The only process performed manually (on purpose) is the SQL migration. Even if that can be automated, we prefer to carefully review those migrations before applying them to prevent serious errors on production. We use Webpack 2 with tree shaking and chunks loading, so the components of each page are only loaded when necessary and therefore do not bloat the minified application code. An app.js file loads the different application components. In the Twig templates, we load the components needed for each page (for example, the address autocomplete component. Front-end performance is often overlooked, but the network is usually the biggest bottleneck of your application. Saving a few milliseconds in the backend won't take you too far, but saving 3 or more seconds of loading time for the images will change the perception of your web site. Images were the main front-end performance issue. Campaign managers wanted to publish lots of images, but the users want fast-loading pages. The solution was to use powerful compression algorithms and apply other tricks. First, we stored the image contents on Google Cloud Storage and their metadata in the database (using a Doctrine entity called Media). This allows us, for example, to know the image dimensions without needing to load it. This helps us creating a web page design that doesn't jump around while images load. Contextual image resizing: for example, the images displayed on the small grid blocks in the homepage can be much smaller and of lower resolutions than the same images displayed as the main article image. Better image compression: all images are encoded as progressive jpegs with a quality of 70%. This change improved the loading time dramatically compared to other formats such as PNG. The integration of Glide into Symfony was made with a simple endpoint in the AssetController and we used signatures and the cache to mitigate DDoS attacks on this endpoint. Load all the elements above the scroll as fast as possible, and wait for the ones below it. Replace these blurred placeholders when the high quality images are loaded. The project includes some interesting forms. The first one is the form to sign up for the web: depending upon the country and postal code fields, the city field changes from an input text to a prepopulated select list. Technically there are two fields: “cityName” and “city” (the second one is the code assigned to the city according to the French regulations). The Form component populates these two fields from the request, as usual. The other interesting form is the one that lets you send an email to someone trying to convince them to vote for the candidate. It's a multi-step form that asks some questions about that other person (gender, age, job type, topics of interest, etc.) and then generates customized content that can be sent by email. Technically the form combines a highly dynamic Symfony Form with the Workflow component, which is a good example of how to integrate both. The implementation is based on a model class called InvitationProcessor populated from a multi-step and dynamic form type and storing the contents in the session. The Workflow component was used to ensure that the model object is valid, defining which transitions were allowed for each model state: see InvitationProcessorHandler and workflows.yml config. The search engine, which is blazing fast and provides real-time search results, is powered by Algolia. The integration to index the application entities (articles, pages, committees, events, etc.) is made with the AlgoliaSearchBundle. This bundle is really useful. We just added a few annotations to the Doctrine entities and after that, the search index was automatically updated whenever an entity is created, updated or deleted. Technically, the bundle listens to the Doctrine events, so you don't need to do anything to keep the search contents always updated. As any other high-profile web site, we were the target of some attacks coordinated and carried out by powerful organizations. Most of the attacks were of brute-force nature and the aim was to take the web site down rather than infiltrate it. The web site was targeted by DDoS attacks eight times in the whole campaign, five of them in the final two weeks. They had no impact on the Symfony app because of the Cloudflare mitigation and our on-demand scalability based on Kubernetes. First, we suffered three attacks based on WordPress pingbacks. The attackers used thousands of hacked WordPress websites to send pingback requests to our website, quickly overloading it. We added some checks in the nginx configuration to mitigate this attack. The other attacks were more sophisticated and required both Cloudflare and Varnish to mitigate them. Using Cloudfare to cache assets was so efficient that we thought there was no need for a reverse proxy. However, a reverse proxy was proven necessary during DDoS attacks: in the last days of the campaign, the attacks were huge (up to 300,000 requests per second) and we had to disable the user system and enable the "Cache Everything" flag on Cloudfare. There's nothing you can do to prevent security attacks, but you can mitigate them by complying with the best practices of Symfony, which, by the way, is one of the few open source projects that has conducted a public security audit. The en-marche.fr web platform and its related projects have been open sourced in the @EnMarche GitHub account. We didn't promote this idea much though, because open source is pretty complex to explain to non-technical people. However, we received some contributions from people that found the project and were glad that it was open source. We are also thinking about giving back to Symfony by contributing some elements developed for the project. For example, the UnitedNationsCountryType form type could be useful for some projects. We also developed an integration with the Mailjet service that could be released as a Symfony bundle. What I'm missing in the introduction is what this project is about exactly, it is a CMS? And what were the technical requirements (what must users be able to do with it, etc.). Good to see this open-source and definitely a case study! @Sebastiaan we didn't explain in detail, but it's a web platform for a political party, so you can expect: articles/news of the candidate, forms to collect donations, forms to sign up for the party, a lot of multimedia contents (videos, photos of political rallies), etc. So it's not only a CMS but a more general-purpose platform. - the core platform which can be seen as a very specific meetup platform, where members can create groups (committees) in which other members can join and participate to events, be notified about the local news of the movement, etc. Thanks for sharing this story. You made my day. For all of us that work on Open Source this is incredible. We have no idea of the power we can have when writing a few lines of code or documentation. Without thinking about it, by working in Symfony we helped change the course of a whole country, and in this particular case of Europe too. This is incredible! Great explanation, Maybe is possible to make this in my country. All project open source is perfect for me is incredible !! Very educative use case, nice! This is really interesting; thank you for sharing. Excellent case study with very interesting technical examples, thanks for sharing ! How do you manage and deliver assets in this way? I mean, you have multiple app instances, each instance could write an asset (lets say, an image). How do you manage where to serve this image from? Do you have the images embedded in the source code, they are distributed among every instance / the cluster or you just use a CDN? When you say: "we don't generate any files at run-time".. What about the the images generated by glide ? Do you warm-up all of them on deploy within their sizes? Assetic has the assetic:dump command.. This is the best case study i have ever read. Be sure to update it with the good questions/answers from the comments here. Now i know i want to replicate your setup in the weekend. @Demostenes Garcia That's a great question. We use Flysystem (https://flysystem.thephpleague.com) with https://github.com/Superbalist/flysystem-google-cloud-storage to upload assets on Google Cloud Storage, and we use it as a backend for Glide. 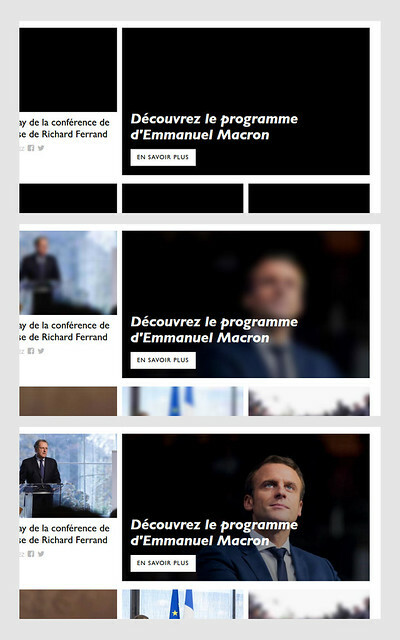 The combination of Glide with Flysystem is the key here, as it allows us to quickly setup upload of the Media entites (https://github.com/EnMarche/en-marche.fr/blob/2e42d5e56149b91cc78f8d171938035217cefefb/src/AppBundle/Admin/MediaAdmin.php#L56). We actually don't have any CDN: we rely solely on Cloudfare to act as a CDN with HTTP cache and it works really well. In addition to this, Glide have cache in Redis (https://github.com/EnMarche/en-marche.fr/blob/2e42d5e56149b91cc78f8d171938035217cefefb/app/config/services/cms.xml#L73). @Pedro Casado As explained right above, we store images on Google Cloud Storage and we use Glide to resize images and store the resized versions in Redis. @Laurynas Mališauskas @ahmedsfny @Tomáš Votruba @Quentin Fahrner thanks for the feedback! Thanks for sharing. And for your answers. Thanks for sharing this, it was very interesting to hear that Symfony was behind this campaign. "The application cache is generated when building the Docker image and then is synchronized amongst the servers using the Symfony Cache component combined with a Redis instance." I suppose you don't use logs as you log everything to sentry, so you ignore log files there. But more important is - where is this cache central stored and how is it excactly synchronized between servers? - System cache is Symfony related cache and it is generated on image build as files in var/cache. It does not need to be shared amongst servers as it's built in the image and won't change at runtime. - App cache is business logic cache that change at runtime. It needs to be synchronized, and we use Redis for that. The notion of app/system cache is native in Symfony, so we only had to configure the app cache (the system cache is automatically configured to use the filesystem): https://github.com/EnMarche/en-marche.fr/blob/master/app/config/config.yml#L47. To connect the app cache to Redis, we use https://github.com/snc/SncRedisBundle and we inject is as a session handler and a Doctrine cache provider into Symfony. During the DDos attacks, did you use the cluster auto scaler (https://cloud.google.com/container-engine/docs/cluster-autoscaler)? for the second round: there was a huge traffic done by real humans, so we had to work on handling it manually. With auto-scaling we may have handled it automatically. However, as it would have been really useful only once or twice in the campaign, I think we would have spent too much time on configuring it instead on focusing on actual features, relatively to the advantages it would have brang. Are the workers managed by RabbitMQ available at github? i can't seem to find them here https://github.com/EnMarche/worker.